Dana’s engine thermal-management products, including Long® filter-mounted engine oil coolers, reduce thermal load to improve engine performance and productivity. 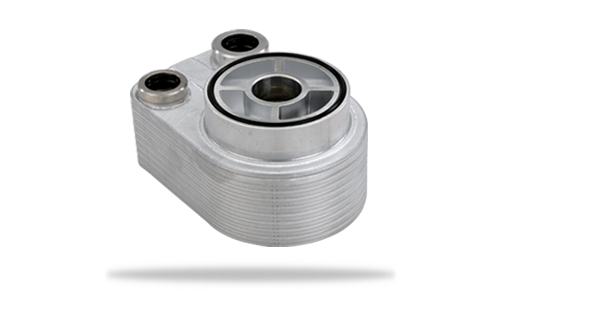 Mounted with a hollow bolt between the engine block and the oil filter, this oil cooler is designed to provide additional engine cooling when design constrains room for a heat exchanger. The oil flow for this cooler is as follows: Engine oil leaves the engine and enters the oil cooler, circulates through the oil cooler, exits it, and enters the oil filter. The oil is then filtered and returns to the engine through the hollow mounting bolt. Cold fluid (cooled water/glycol) comes from the radiator circuit. Optimal performance is achieved when the cold fluid is taken from the exit side of the radiator.